Thanks to Fr. 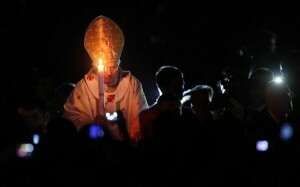 Imbelli for drawing our attention to the Pope's homily from Easter Vigil (full text here). I am always enriched by Pope Benedict's utilization of early Christian texts and traditions in his explication of Catholic faith and practice. The Vigil is the perfect time to recall the centrality of "illumination" (photismos) in the early Church. For contemporary listeners, ideas of illumination or enlightenment might sound more at home in Buddhism or even "new age" spirituality, but in fact, they were at the heart of early Christian initiation, especially in the east (Egypt, Palestine, and Syria). For example, when Cyril of Jerusalem describes those preparing for initiation, he often calls them "those about to be illuminated/enlightened" (photizomenoi). Moreover, the "light from light" image was so indispensable as a symbol of the idea of undiminished giving that it can rightly be thought of as the foundational image of Nicene Christology (cf. Jaroslav Pelikan's little gem of a book, The Light of the World: A Basic Image in Early Christian Thought, 1962). But what caught my attention even more is the quotation of Jesus with which Fr. Imbelli's excerpt concludes. The Pope said: "'Whoever is close to me is close to the fire,' as Jesus is reported by Origen to have said." It's true that this is one of the so-called agrapha from the early Church, things which early Christian writers said that Jesus said, but which the New Testament does not record. And it's true that Origen said that Jesus said this, and Jesus certainly might have said this.But another true way of reporting the quote would be: "'Whoever is close to me is close to the fire,' as Jesus is reported by the Gospel of Thomas to have said." (It's logion #82, for those interested.) When the Nag Hammadi hoard was discovered in 1945, and the Gospel of Thomas came to light in full for the first time, this agraphon of Jesus was thus corroborated by a text, albeit a noncanonical one. It also appears (in a probable textual reconstruction) in the recently published and obscure Gospel of the Savior of unknown date and provenance (line 71, published by Stephen Emmel).What impresses me is the openness of the Pope to noncanonical influences on his view of Jesus, even at the summit of the liturgical year! The Pope is a scholar of the highest order, and he certainly knows that this agraphon was corroborated by the Gospel of Thomas. Even Origen himself is not necessarily a "canonical" figure, his memory and ideas having been controversial in Christian history (see the Second Council of Constantinople, 553). And lest we think the quotation of this noncanonical agraphon is anomalous, let's recall that in the first volume of the Pope's Jesus of Nazareth, he uses both the Gospel of Thomas (logion #108) and the noncanonical Didache to illuminate aspects of the Gospel of John. In short, then -- and if I may quote myself -- despite the Popes championing of canonical exegesis (reading the individual texts of the Bible in the context of the whole), he does not in practice treat the canonical boundary as an impermeable wall. It is a barrier, to be sure, but more like a fence, through whose gaps the Spirit can still blow insightful seeds -- or sparks of illumination -- from outside.